Stein is the Blueprint NC candidate and has been a very vocal supporter of Blueprint NC attack tactics such as Moral Monday. I am sure that his former NCGA colleague, Rick Glazier, will have his back now that Glazier is heading up Blueprint NC’s parent organization. Who or What is Blueprint NC? Let’s step back to 2013, when an attack memo circulated by a non-profit called Blueprint NC was leaked to the press. View a copy of the actual memo. After the memo was leaked, the list of partners surfaced along with the large amounts of money being funneled into Blueprint NC by various non-profits. One such non-profit funding Blueprint NC is the Z. Smith Reynolds Foundation. The Z. Smith Reynolds Foundation was by far the largest donor to Blueprint NC both directly and indirectly through the NC Justice Center. The grand total through 2014 is $2,750,000. The break out is below. While the article quoted above no longer exists at Charlotte Observer, plenty of other websites have partial cached copies. Gerda Stein is the sister of Senator Josh Stein. 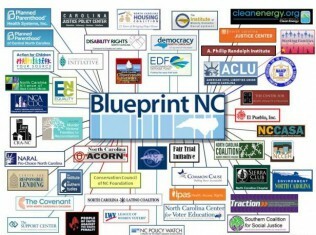 Ms. Stein is and continues to be very involved with far left leaning groups and is still on the board of Blueprint NC. Gerda Stein was one of the top contributors to her brother’s campaign in 2014. Stein’s sister isn’t the only Blueprint NC contributor to his political campaigns. To name a few other donors to Stein from the Blueprint NC gang, according to the NC Board of Elections report search, both Mary Mountcastle and Jim Goodmon have been big donors to Senator Stein. The campaign finance reports also revealed Senator Stein’s affinity for using Democratic campaign tools like NGP VAN which are tied to Obama’s election database machine, Catalist. This entry was posted in BlueprintNC, ELECTIONS, LL1885, NCGA, The Articles and tagged BlueprintNC, Gerda Stein, Josh Stein. Bookmark the permalink.